Liam Farrell concedes he has a fight on his hand to reclaim his place in Wigan's starting line-up. A stalwart of the left-side backrow over the years, Farrell missed nine matches with a shoulder injury before making his comeback in Friday's gritty 14-12 win against Hull FC. And during his absence, Joe Greenwood has shone in his old position. And with John Bateman a towering presence on the right side, and No.13 Sean O'Loughlin fit to face Castleford in Friday's semi-final, Shaun Wane has a welcomed selection headache in the backrow. "We've spoken to Waney about that already," said Farrell. "Joe and John are both doing really well and it's healthy competition - and that's what you want. "Waney has some tough decisions to make and I wouldn't want to be in his seat. "I'm looking to get into that squad but it's obviously his decision." Farrell was a late call-up into last Friday's squad and was pleased to get some game-time from the bench, in readiness for Friday's crunch showdown at the DW Stadium. "I'm glad I played, if he had decided to throw me in next week (without having played) I'd have been a bit nervous," he said. "I feel better for the 30 minutes. "I felt good, my shoulder was good and I had no problems with my fitness. "It's a bit of a strange one, coming off the bench - it brought it all back from when I used to do that in 2010 and 2011 - but the team we have is strong, and not many injuries. "I was just glad to get the minutes in me." Meanwhile, the Super League DreamTeam will be unveiled at Old Trafford today. 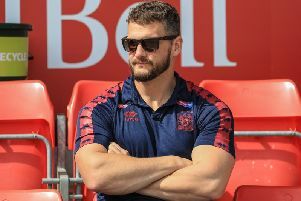 The fictitious line-up is selected from a panel of journalists and broadcasters - Wigan's John Bateman, shortlisted for the Steve Prescott Man of Steel, is expected to figure.